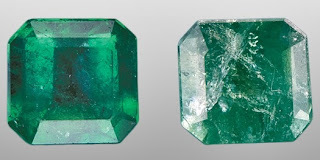 Emerald is one of the four "precious" gemstones, along with diamond, ruby and sapphire, and some people include Aquamarine in the "precious" catagory. Emeralds often have inclusions or fractures. In fact, a natural emerald with only minimal fissures is VERY rare and is worth far more than a diamond of similar carat weight and clarity. Many fine quality emeralds used in jewelry have minor surface flaws. Oiling, a routine practice that’s been done for many hundreds of years, improves the appearance of the stones and does not affect their value or durability. Newer technologies make it possible to sell extremely flawed, low-quality emeralds that previously would have had to be discarded. Without "clarity enhancement," any observer would see these stones as defective, or extemely unattractive. But after enhancement, they look good to all but a trained gemologist observing them under high magnification. Problems with the enhancement may not show up until much later. Meanwhile, emeralds of poorer and poorer quality are finding their way into jewelry. Clarity enhancement has a serious effect on valuation. A fractured-filled emerald is worth significantly less than one of comparable appearance that is not "enhanced." Fracture-filling is not considered a permanent treatment. Fillers are likely to break down under cleaning with steam or ultrasound, they can be harmed by heat from a jeweler’s torch if the stone is reset, or they may simply break down over time. A filling may turn dark or white or simply deteriorate, leaving the fractured stone in its original condition. In some cases, fillers may even expand over time, causing the stones to shatter. Fracture-filled stones are worth considerably less than unenhanced emeralds of similar size. It’s essential that the treatment be disclosed at every step in the selling chain. Fracture filling may be done to emeralds that have only slight fractures, or it may be done to stones that are riddled with fractures—unattractive, low-quality stones that in their natural state no one would want. Fractures in an emerald not only make the stone less beautiful but also weaken it. An emerald that has its fractures filled in will look better to the naked eye, but it’s still a brittle stone, susceptible to breakage. A trained gemologist can detect the extent of fracturing and filling, but most jewelers are not trained gemologists and may not even examine the goods they sell. Emerald is my birthstone and I LOVE them as well as the other beryl, Aquamarine. I'll have to go and take a closer look at my emerald jewelry----not that I care, really, but I'm curious after doing this little bit of emerald "research". I had a 3-stone emerald ring that I LOVED but one day while working at home, I looked down and the center stone was GONE, but the prongs were fine. I'm guessing the emerald shattered and fell out, since I never did find the stone anywhere. Maybe it was enhanced and then shattered--I guess I'll never know!